I remember standing in our nursery after my first baby shower staring into the closet. Look at all these adorable outfits. I couldn’t wait to dress my real life baby doll. In my mind, I was putting together coordinating outfits with a cute bow and socks. It was a dream come true. This girl was going to be better dressed than her mom, for sure. Then all of a sudden, she turned three and got an opinion. Choosing clothes for the day became a battle of the wills. She no longer liked what I was picking out. After several weeks of morning fights, I had to stop and think about if this was a battle I had to win. As I thought about it, it clicked that this was more about me wanting her to look a certain way instead of respecting her individuality. Even though she was a little girl, she already had specific taste and knew what made her feel comfortable. Once I stopped caring about what other people would think or say, her outfits became a source of entertainment. 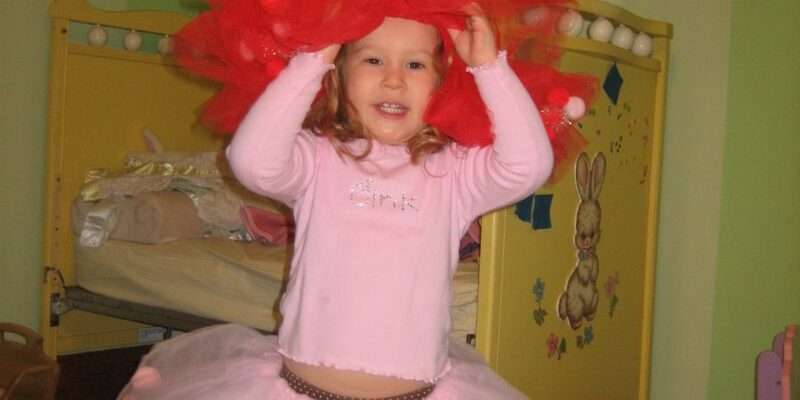 Everyday for about a year, she wore a dress to school with a tutu on top of it for extra fluff. She personified the essence of a girly girl. There were times she wore sleeveless Easter dresses in the dead of winter stating that she wasn’t cold. In order to keep her healthy, I suggested she put leggings on underneath and a long sleeve shirt without compromising her style. After a year or so of experimenting with her clothes, she could piece together outfits that made a little more sense or were seasonally appropriate. Now at 10 years old, her clothes have become a non-issue for us because I let her take the reigns when she was preschooler. She is confident in knowing what she like to wear and feel comfortable in her skin. As a parent, the best part was having more time back in my mornings because I wasn’t stressing out about her wardrobe. This allowed me to focus on more important things like feeding the kids breakfast and getting us out the door in one piece. This is not gender specific either. My boys are the same way as their sister. They will find a shirt they love and pants that are comfy to wear for the day. Who cares if they don’t match at all, it’s about giving them the responsibility to choose what feels good to them. And then they wear the crap out of it. My oldest son wore a red shirt and red sweatpants all the time until he grew out of the clothes. It was the first outfit he would pull from the laundry piles as soon as it was clean. All three boys love the monochromatic look. My five year old came downstairs the other day in a blue polo shirt with blue jersey knit shorts. He was so proud of himself for “matching.” All I do now is smile because I am happy that all four of my kids can physically dress themselves and are figuring out their own sense of style. If they want to wear a superman cape and a minion hat to the store. More power to them. This is a developmental stage where I want them to know they can freely express themselves. It’s a safe environment to do so in and it’s not hurting anybody. In fact, it is helping them grow as a person. The only time I question them is if they come down in winter clothes when it’s 100 degrees out and vice versa. My kids are all about simplicity and comfort. Even my daughter. There may come a day where they start to care about their clothes. For now I love that they know their worth isn’t based off the clothes they wear but who they are as a person. Clothes are a way for my children to individualize themselves and not worry about fitting into a certain mold. I love that they they don’t care what their peers think about their choices. Since we haven’t made a big deal out of clothes, the kids know the real interesting part is the person underneath it all.